Bitclub Advantage Academy Review – Diverse Crypto Solution or Deceptive Investment Scheme? Bitclub Advantage Academy, hosted at BitclubAdvantage.Academy, operates as an interesting and undefined investment opportunity for cryptocurrency investors. Operating as the new domain of BitclubAdvantage.com, which endured widespread scrutiny, Bitclub Advantage Academy currently functions as an online crypto platform that enables investors to enroll with their crypto academy, having their funds managed by their team of professional traders. While we remain quite skeptical regarding these assertions, we nevertheless will conduct a thorough and unbiased review into Bitclub Advantage Academy. Extract the facts regarding this inquisitive cryptocurrency operation and decide for yourself whether this operation is a feasible solution to achieve your financial endeavors. Bitclub Advantage Academy portrays their platform as a dual-dimensional platform that allegedly renders educational courses regarding cryptocurrencies and provides an investment solution for crypto investors. However, upon further investigation it appears that Bitclub Advantage Academy simply functions as an affiliate marketplace that supports their own educational courses and investment solutions. Allegedly, Bitclub Advantage is a company formed by a team of professional traders with expertise in the cryptocurrency markets, yet no disclosure regarding these professional traders or corporate entity are referenced anywhere on the site. According to the Bitclub Advantage Academy site, their goal is to make their users profits through the frequent buying and selling of digital currencies. Supposedly, their team of financial experts analyzes the markets in real-time to generate high probability investment signals for their users. No mention of which brokerages or exchanges are synced with Bitclub Advantage Academy is disclosed nor are any references made in regards to predicted ROIs. How does Bitclub Advantage Academy Work? BitclubAdvantage.Academy prioritizes their operation around their anonymous affiliate marketplace where they solely support their own product line. Cryptocurrency investors looking to enroll with Bitclub Advantage Academy must register and verify their account through their homepage where upon completion will be prompted to pay for their membership package. After a user has paid for their membership package they will be able to receive access their cryptocurrency courses and receive a daily return depending upon the level of effort they exert to successfully convert new members. 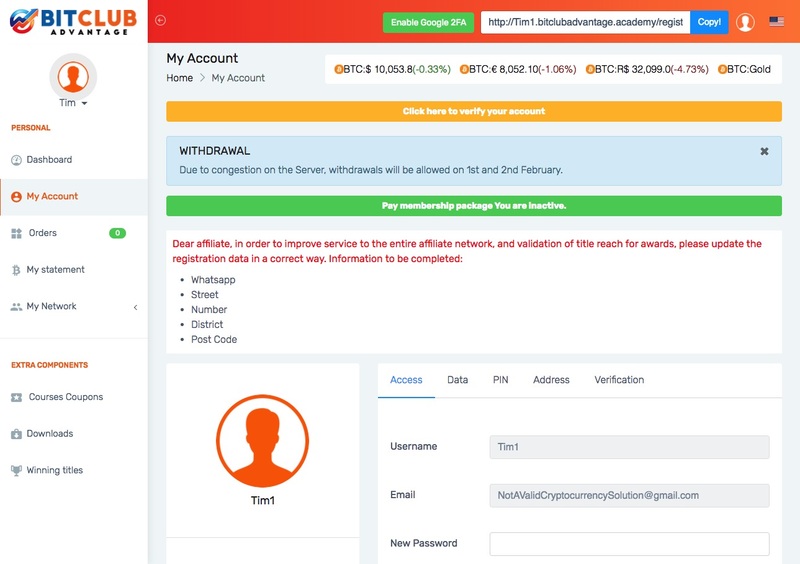 While the promotional video at BitclubAdvantage.Academy asserts that their operation enables members to have their deposited funds professionally managed, we could find no component on their membership portal to verify this claim. Which leaves members with only being able to utilize their educational courses and affiliate tools as a method of attracting new members to receive commissions in return. While investigating BitclubAdvantage.Academy, we came across several red flags that we felt needed to be addressed. Such as if they company was allegedly created by professional traders then why did they not include their active corporate entity? Why does the site evasively and deceptively portray their operation as an educational and investment platform when in reality it is an affiliate marketplace? Is BitclubAdvantage.Academy regulated or licensed as a brokerage to professional manage members funds? Are their allegedly trading professionals licensed as well? Then of course we have the blatant lack of identifiable and contact information. No transparent methods of communication are disclosed to visitors anywhere on the site. Operating with no transparency, Bitclub Advantage Academy only offers members the ability to email them at [email protected] or use their contact submission form found near the footer of their site. Furthermore, a WHOIS report will reveal that their site was privately registered, so it is obvious that the creators behind this site didn’t want any affiliation or liability with their operation. BitclubAdvantage.Academy reflected a SimilarWeb global rank of 73,818 with a Nigeria rank of 269 as of January 31st, 2018. According to the report, Bitclub Advantage Academy receives over 83% of their traffic from consumers who reside within Nigeria (27.90%), Brazil (20.19%), Italy (15.77%), Tanzania (11.44%) and South Africa (8.18%). Approximately 25% of the sites cumulative traffic is derived from referral based sources while email and social media outlets account for an additional 7.27%. Can Bitclub Advantage Academy be Trusted? Bitclub Advantage Academy does not seem to be a trustworthy investment solution. Providing no verifiable or transparent ownership or contact information, Bitclub Advantage Academy is blatantly concealing their identity and operating with complete anonymity. When it comes to investment solutions that deceptive portray their operation while providing minimum details to begin with, it is evident to us that Bitclub Advantage Academy is not a suitable investment opportunity for cryptocurrency investors. Bitclub Advantage Academy is a risky and anonymous cryptocurrency platform that fails to be held liable for their business practices while leaving prospective investors with a substantial void of need-to-know operational insight. As we always preach, when it comes to online investing, make sure you only invest with transparent operations that are outright from the beginning regarding their operational model and provide ample amounts of verifiable ownership information. Review Verdict: Bitclub Advantage Academy is NOT Safe! Do you have an experience or insight to share regarding Bitclub Advantage Academy? Please provide any feedback or knowledge you may possess by leaving a comment below! For more serious money making alternatives, we recommend visiting our Cryptocurrency Day Trading Center. I want to ask why there has not been any update from your end. Please are you having a system upgrade or you are faced with a circumstance beyond control. Please I need a feedback, thank you. Am beginning to to feel that bitclub advantage is a scam, I have 2 accounts with them and made withdrawal in one for d past 2 months yet no payment one story after d other, I advice don’t put ur hard earned money into this rubbish. I Agbayim Faith Chioma had been unable to login in to my bitclub advantage 3.0 account immediately after upgrade, i request for bitclub advantage 3.0 account reset in other to enable me to login in. Alex what is bitclub’s main objective? I am just terrified. Kindly let me know the way forward or the way backward. I don’t understand what is going on, am confused. My activation account is showing 000$ of which I did register and my daily activation is not upgrading why is this happening.? I registered with Bitclub Advantage in Nov 2017 for the Oremimum oackagr of $1000+ and only got paid once the month after thru my upline. After which an upgrade was carried out on the 2.0v to 3.0v. After the long period of upgrade the money accrued in 2.0v became traoped there till today. Said we can get it for activation of new recruits which l didnt plan for. Then company came up with the idea that for you to be active to withdraw in 3.0v every member must upgrade to the next higher package. I managed to upgrade to’ Black package’ at the ebd of which l now had access to the withdrawal button which was not there initially. Then l was waiting like others who have suffered to upgrade to be able to withdraw, but no way. The company- Bitclub Advantage came out with a communique that because of the low value of bitcoin with which the company had tagged at $11,800 to pay members was at $8,000 therefore cannot pay until things look up with greater value from bitcoin; this was even so the last time bitcoin when as high as $9,213 to the dollar. To the present, since the past one month it is on e promise or another without been able to keep up. Now, the company Bitclub Advantage said they have acquired ATM coins and would pay us by each member going to bitsblockchain.net to register and have the ATM coins transfer there to each member; still that has failed too. Dont know what next to expect from this comoany. Many people’s hard earned money are tied down . So if to say if Bitclub Advantage is a scam, l wait to conclude on that by next month this same time. However, l will never advice my worst enemy to invest with them now. It’s that simple. I’m very sorry but identifying this person is impossible. I joined bitclubadvantage on February 2018 and subscribed to Client Gold, I paid $514 as activation fee. When I earned my first $100 , i decided to withdraw it into my blockchain wallet. I made a withdrawal request and immediately the system deduct it from my account but NEVER pay it onto my blockchain account since April 15, 2018. I did follow up all the time to find out from their support email but no reply as at today 29/04/2018. Bitclub advantage is legit. The CEO is Alex Perari. The company keeps to his promises to affiliates and transparent enough. Thank you. This review and assertions are inconclusive. Bitclubadvantage.academy describe the founder with names and history, it analyses and educates it’s affiliates with details of the investment operations and gives consistence and updated news on the company’s investment activities. Focus on the advert of the intended investment …. Cryptocurrency Day Trading Center…. Not condemning other investments and discouraging investors. Please help me analyze this site because they have been in operation since June 2012.
sounds like bitcoinrobot.com but under a different name,right?